ConnectCode Barcode Image Generator is a full-fledged image engine that allows you to generate professional and high quality barcode images. Typically, we would suggest using fonts for creating barcodes. This is because barcode fonts raster to the output device and are not limited to Dots per Inch (DPI) of the computer screen. However there may be scenarios where your customers or partners simply require a barcode image from you. This is where the Barcode Image Generator is useful. The Image Generator supports various important parameters to ensure the generation of barcodes that can be scanned easily. This includes the Min Bar Width, Bar Ratio and Resolution of the image. 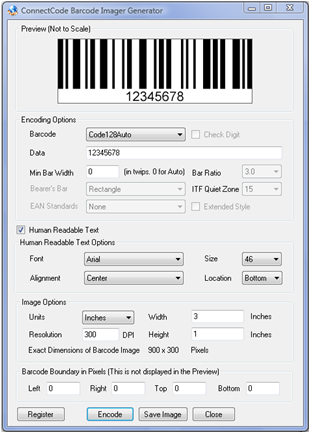 It is useful to save the barcode images as a Metafile or at least in the PNG format. The Metafile is a vector format and can be scaled easily whereas the PNG format is a lossless image format. Windows Start Menu -> Program Files -> ConnectCodeTrial -> Resource-> Barcode Image Generator -> Barcode Image Generator.